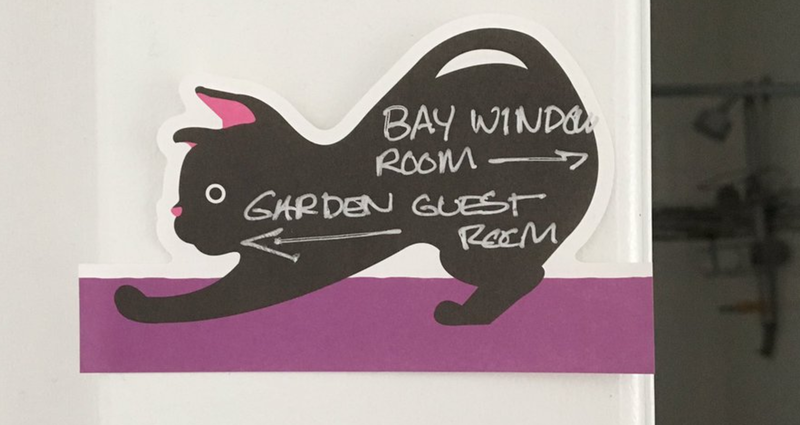 After staying in over 100 Airbnbs, I have noticed a pattern: the use of post-it notes and labeling to create a smooth host and guest experience, especially when the host is not present. 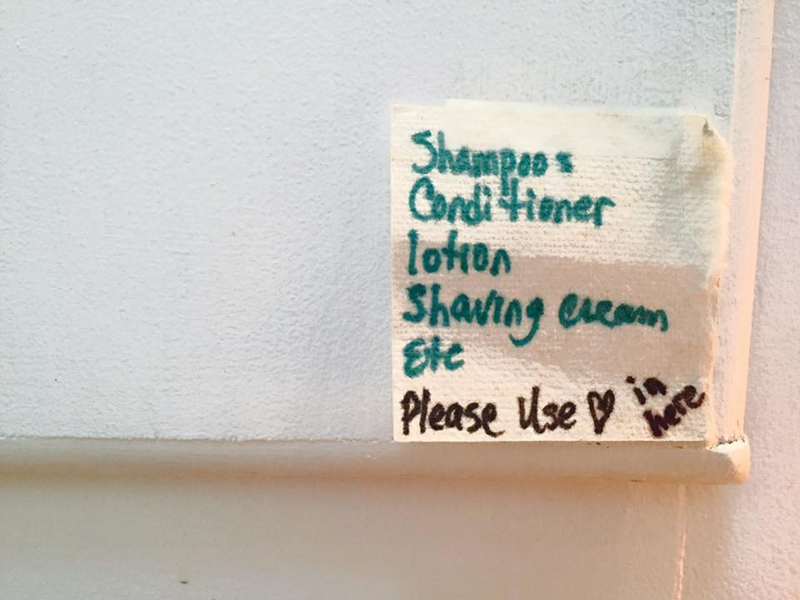 Written notes (post-it / labels) is an integral part of Airbnb Hospitality. 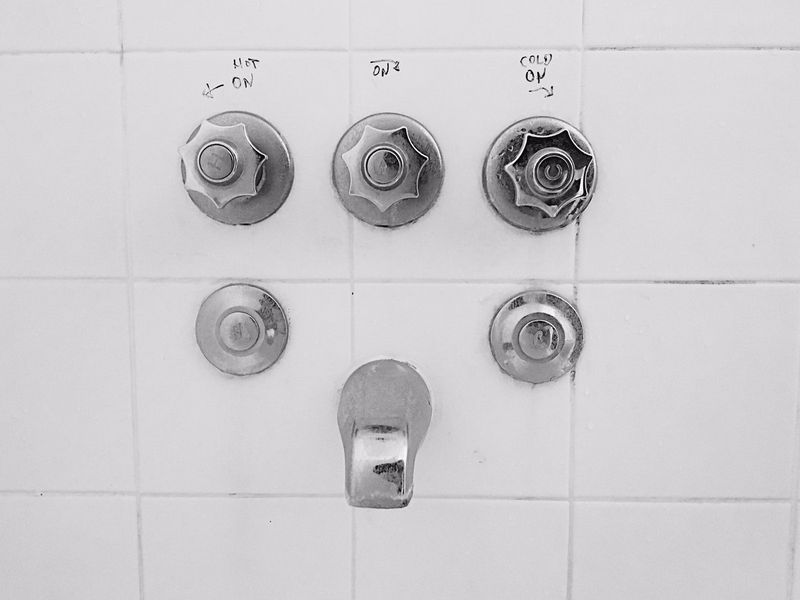 They are used during key moments of an Airbnb experience: check-in, check-out, figuring out how shower works, or understanding the level of freedom to use the kitchen or the laundry machine. 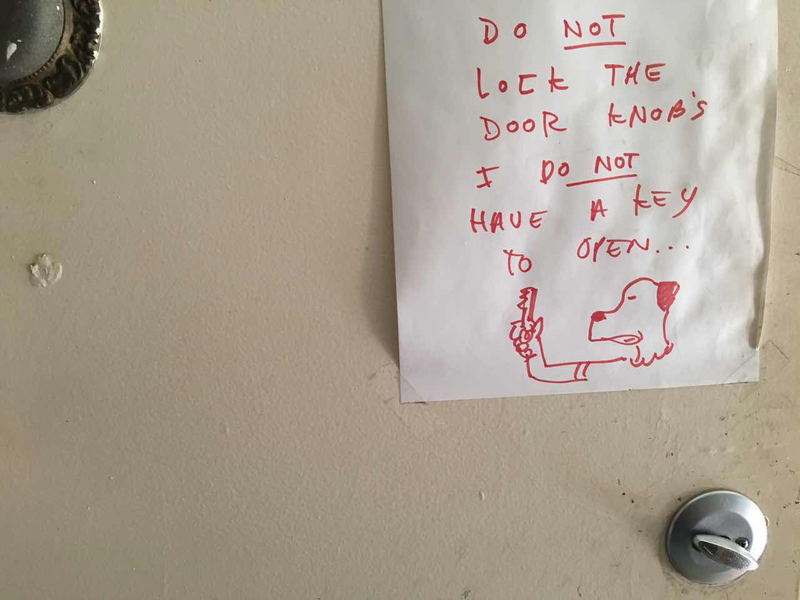 First, written notes clearly communicate house rules with visual references to the physical objects (light switches, doors, the fridge etc) without confrontation. It can be more effective and timely than sending a long PDF before guest arrival. Most millennial don’t read manuals carefully. 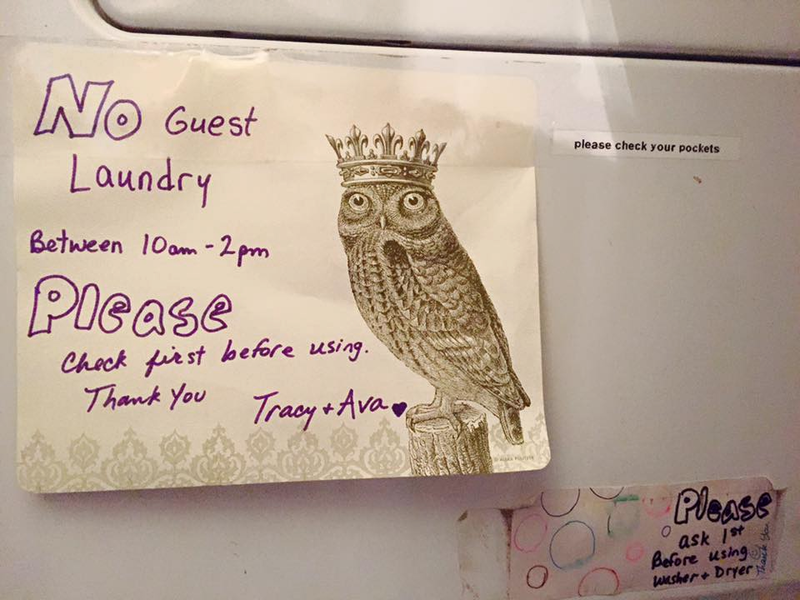 Second, how the note is written can humanize the “house rule” communicated via email or Airbnb app. 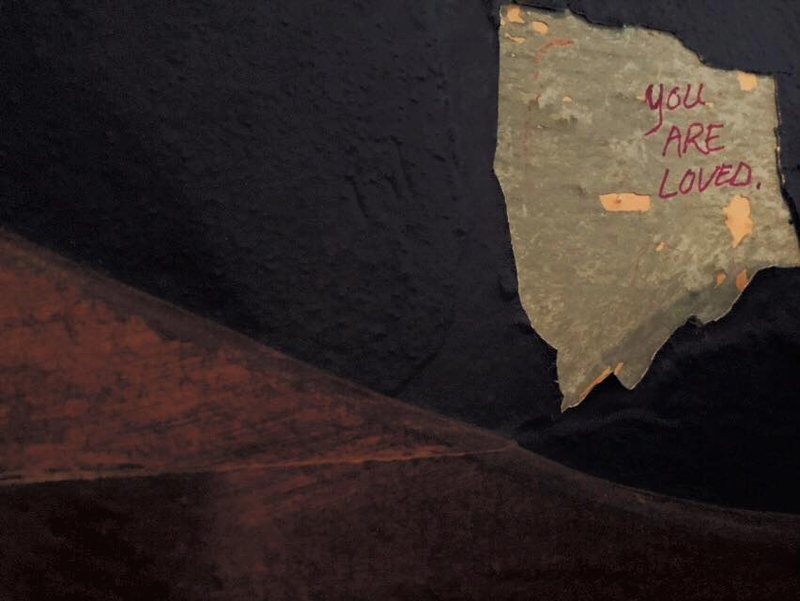 An inviting language, an emoji, a heart sign, or a simple “thank you” shows kindness and care to a perfect stranger. 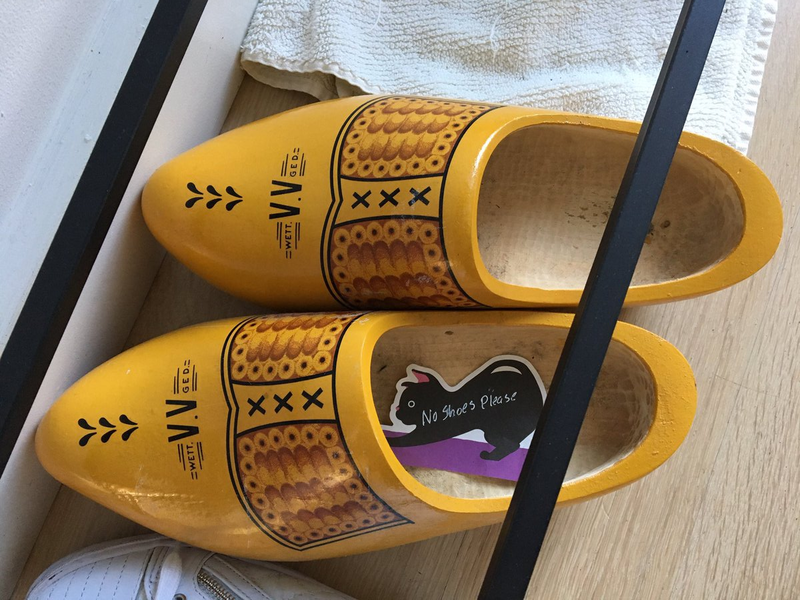 Some hosts go above and beyond to add self-expression and humor via drawings and whimsical languages. For Hotel hospitality, the expectation includes standardized services such as concierge, mini bar, laundry and daily cleaning. 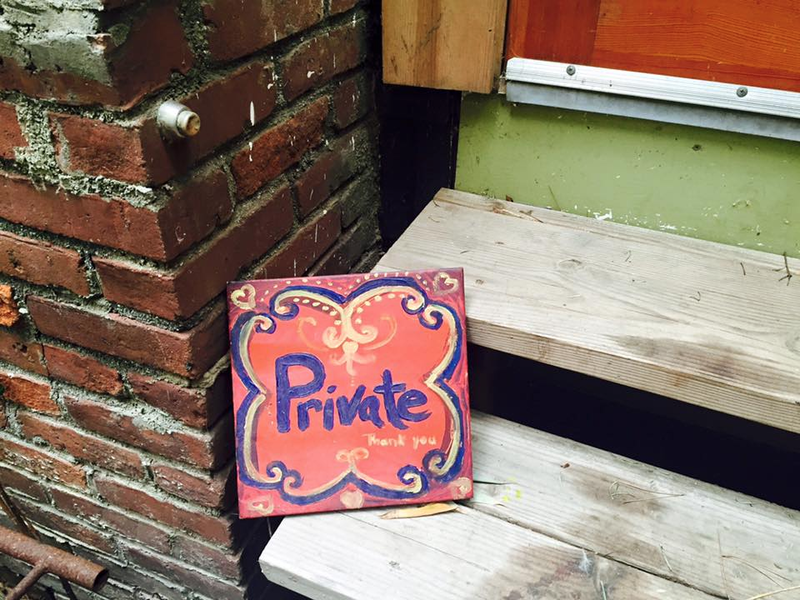 Each Airbnb home can be unique with none-standardized level of hospitality and house rules. This article explores the art of non-verbal communications via post-it notes and labeling. It is organized by the progression as you pass through a house from check-in to check-out. 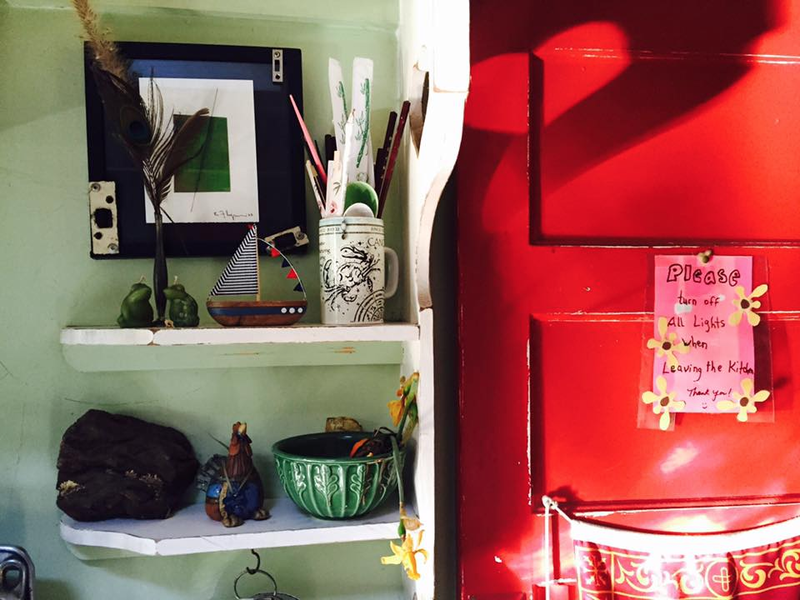 When an Airbnb has multiple rooms, it’s important to direct guests to the right room. 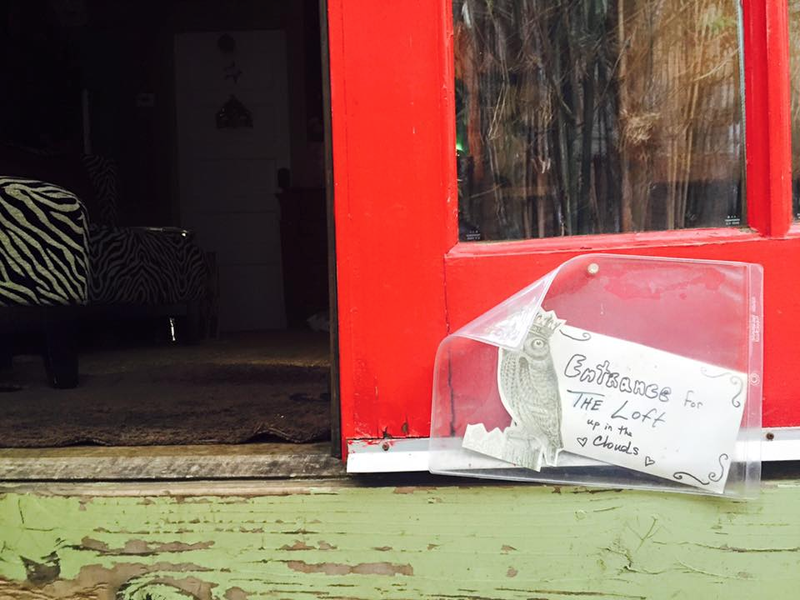 an anecdote: the Airbnb description from host says “enter through the French Doors”. I was wondering what are French doors. A sign was timely to direct me to the right room out of 7 rooms. 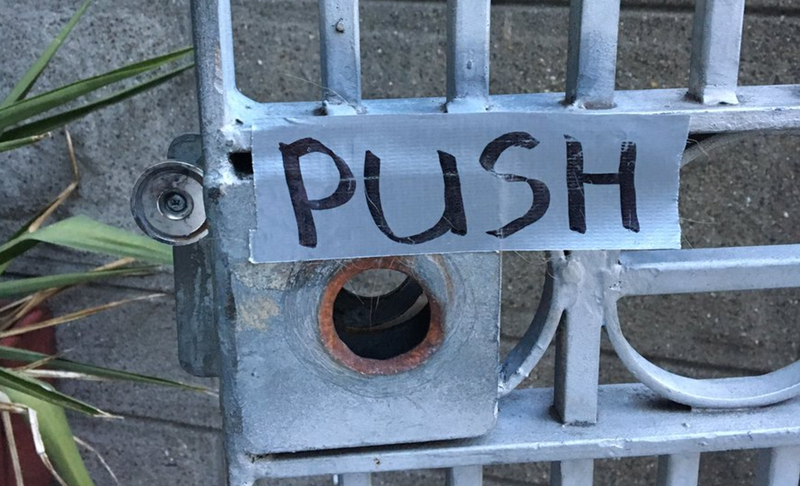 The need to put a “PUSH” sign suggests that either the door is malfunctioning or not intuitive in design. 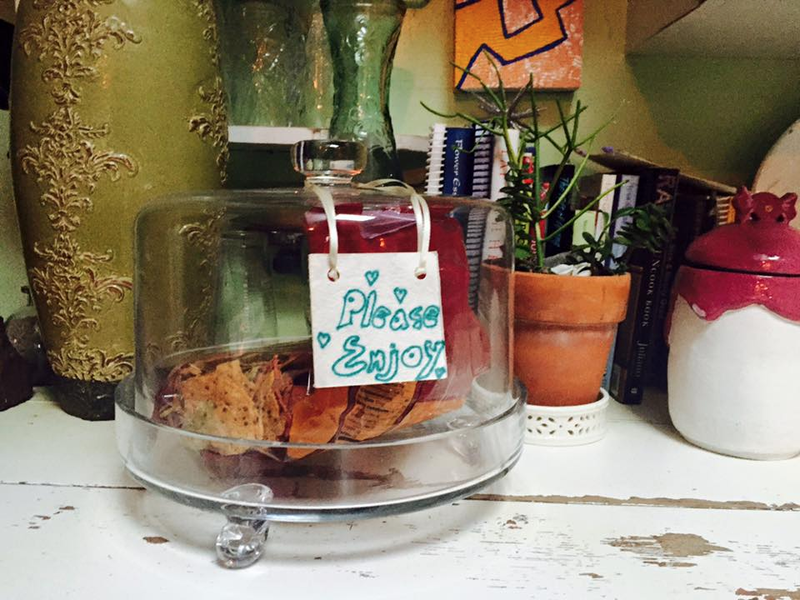 A cute post-it note is a gentle and whimscal way to tell guests to take off shoes. 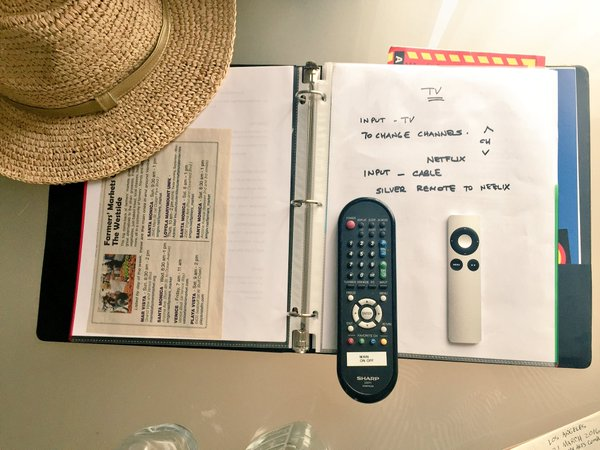 I learned from the Airbnb nomad living that there are 50 ways to turn on a TV. Precise and clear instruction is crucial, especially when there are 3 remote controls. 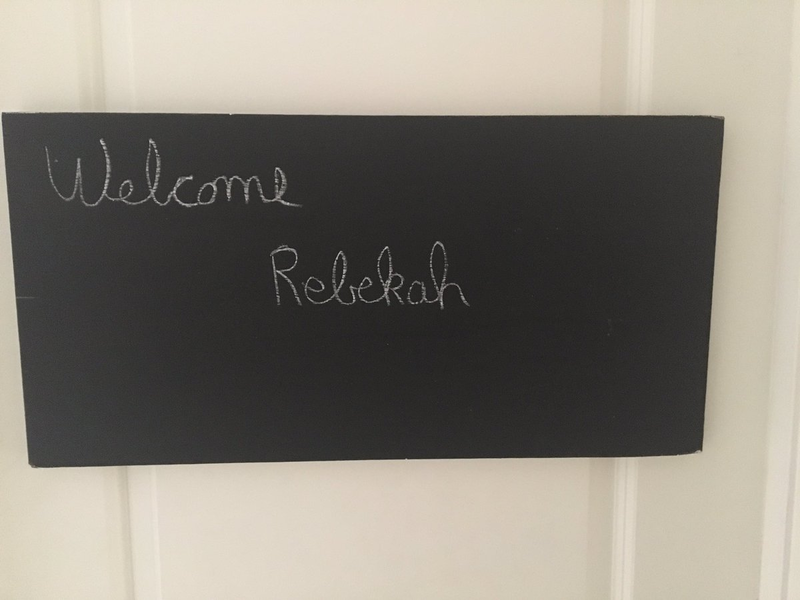 When a house has multiple guest rooms, a clear label can help the guests to locate the correct room. 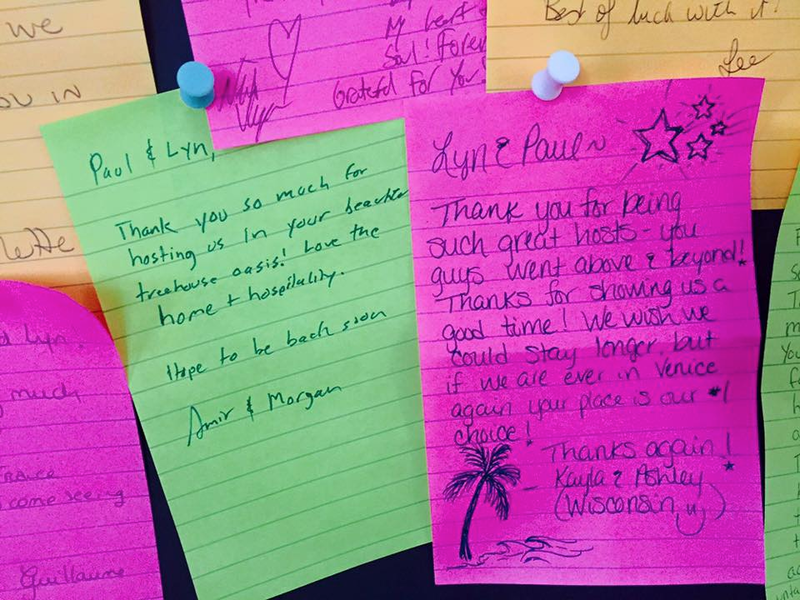 A personal welcome letter in the bedroom can make the guests feel at home. It feels even warmer when the note is decorated with drawings or details such as using ❤ instead of bullet point. 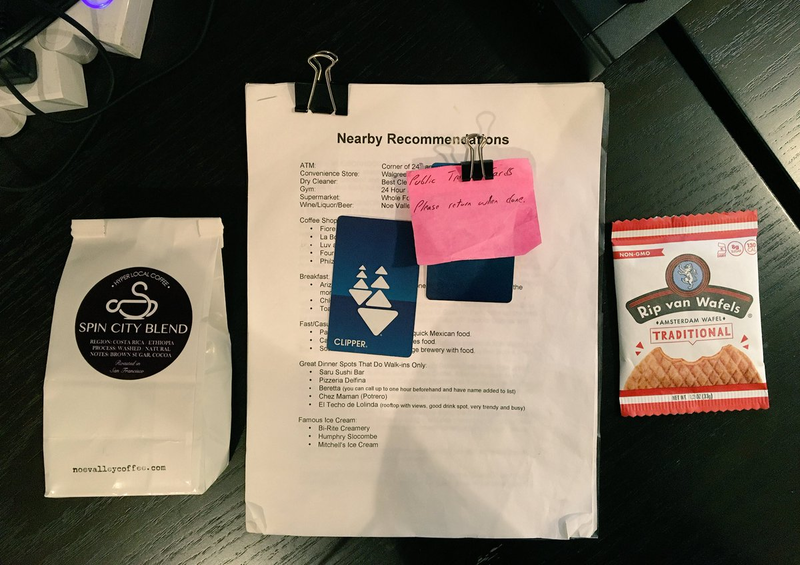 Providing a welcome packet with recommendations is a gesture of Airbnb hospitality. To take it to another level, provide a public transportation card for guests to get there. 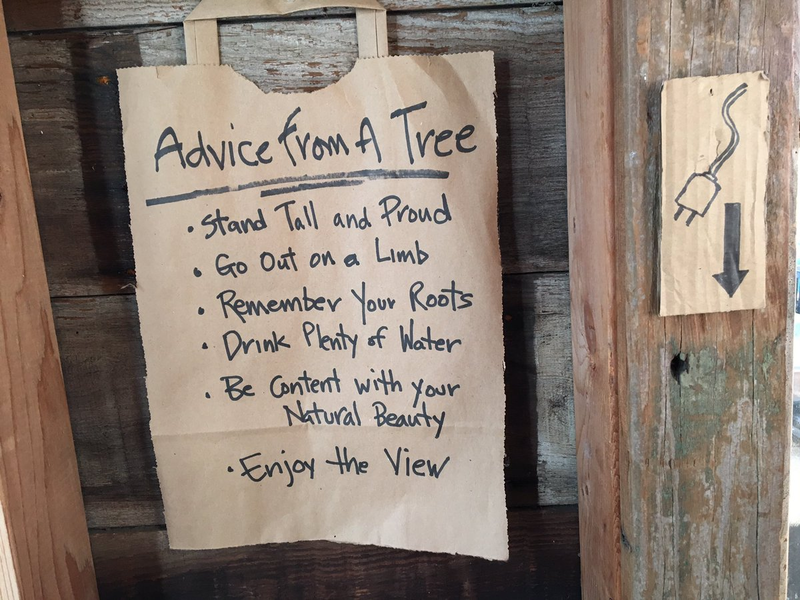 For unique homes, such as a treehouse, adding a few tips from the tree is a thoughtful and memorable detail for guests. Some Airbnb homes have vintage furniture from Mexico. 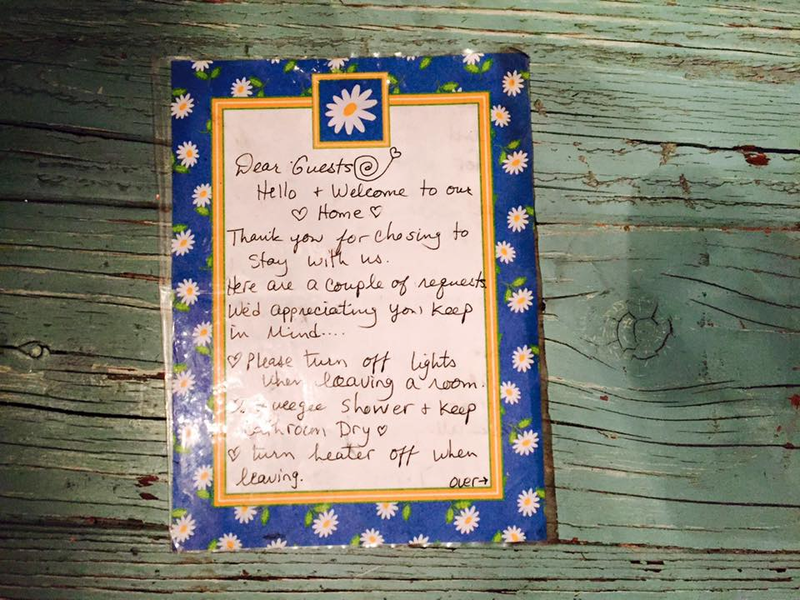 Laying out rules can help regulate guest behavior and prevent potential negative experience. 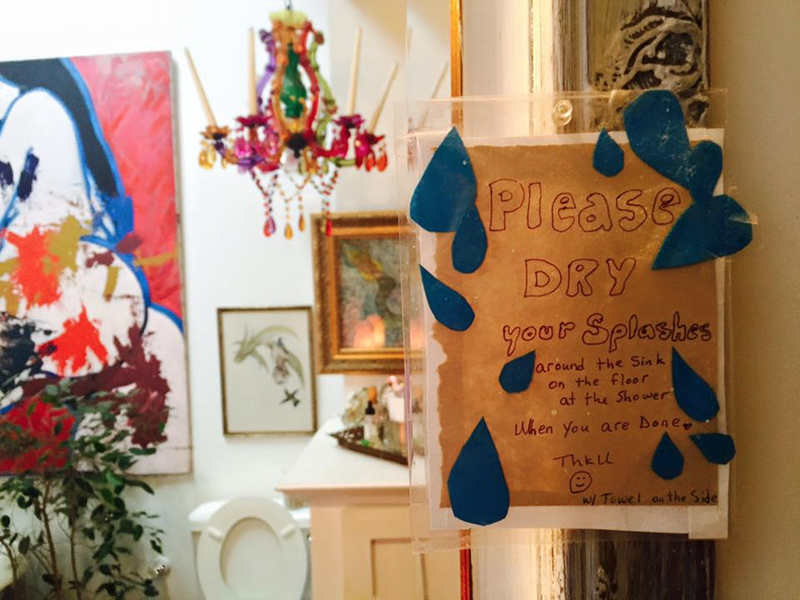 Conserve energy: remember to treat the Airbnb home like your own. This host is an artist and she effectively communicated fact while incorporating a few flowers. At the end of a trip abroad, have you wondered what to do with the left over coins of Yens, RMBs, Pesos? 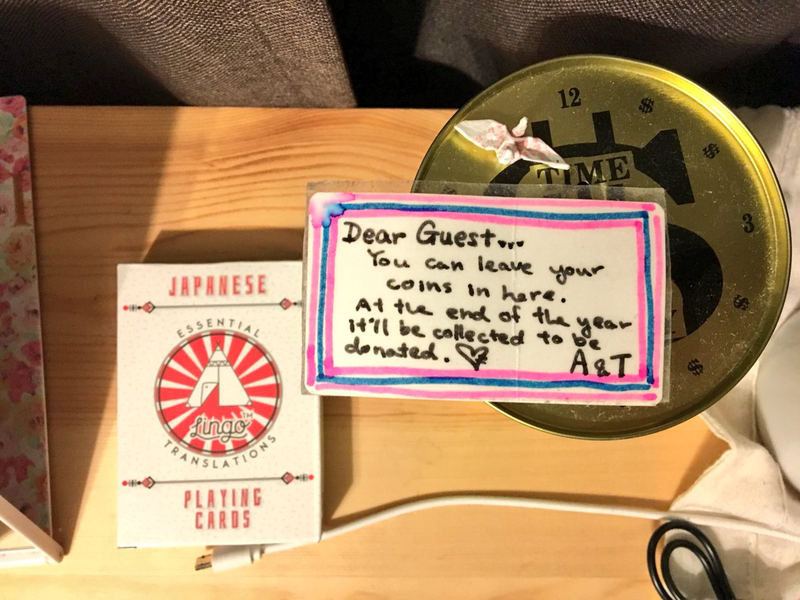 This host in Tokyo has a smart solution — a donation jar. Hosts extend their life to guests in different levels. 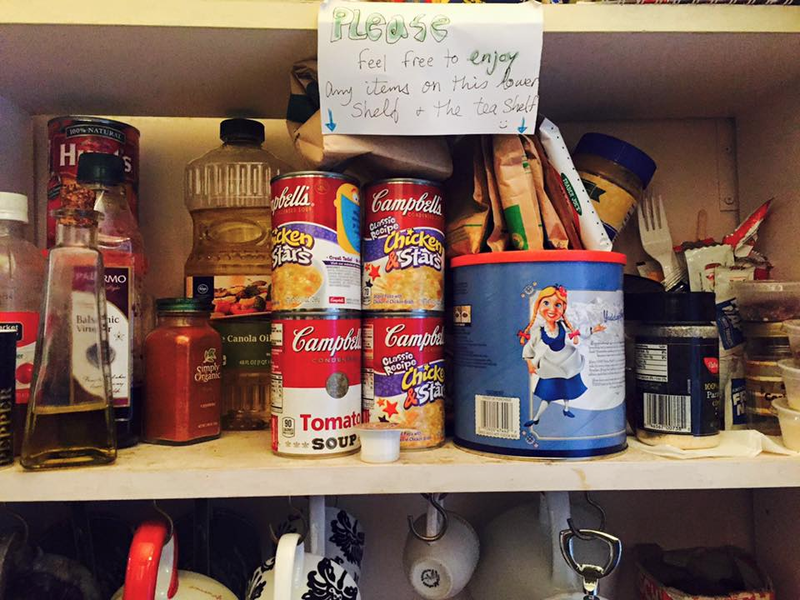 Some share their full kitchen, some prepare a welcome snack basket, while others do not share any food with guests. A note “Help yourself” can help reduce the confusion. 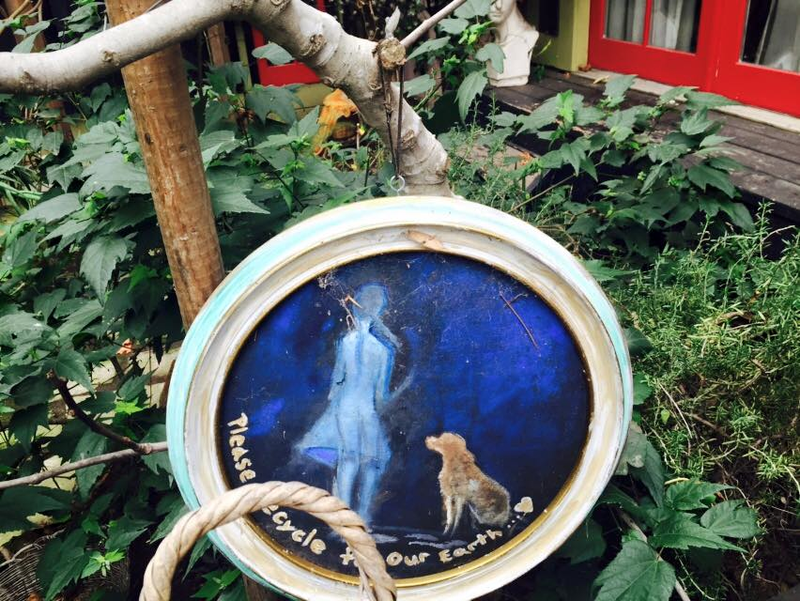 Recycling and Composting are not common in all cultures, and even outside West Coast America. 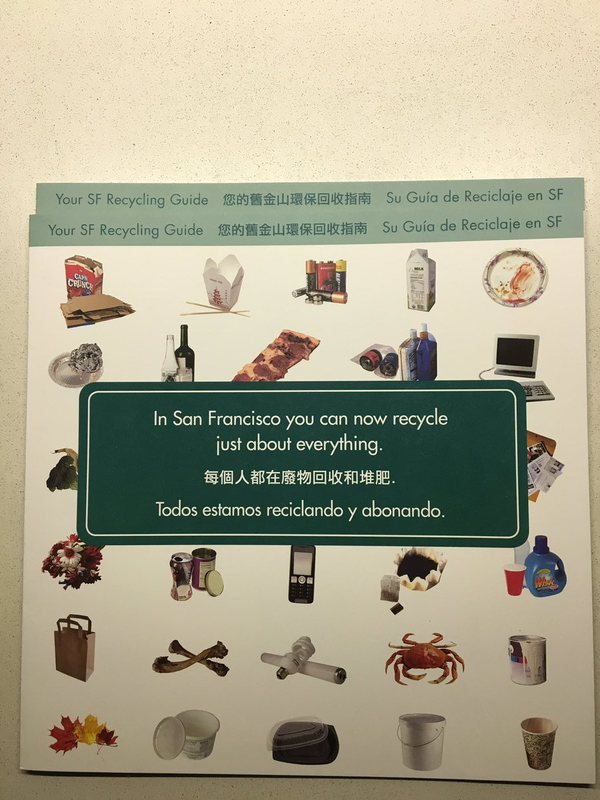 Having a recycling brochure could be handy. Some hosts share the entire fridge with guests. I find it most practical when there is a designated shelf for guest groceries and one for shared items. 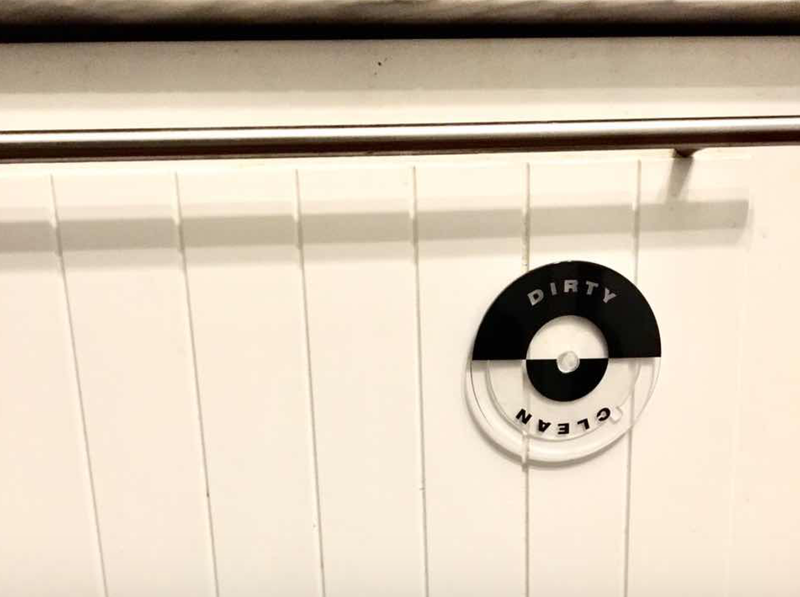 A dishwasher spinner helps distinguish clean vs. dirty dishes, especially handy with multiple guests. 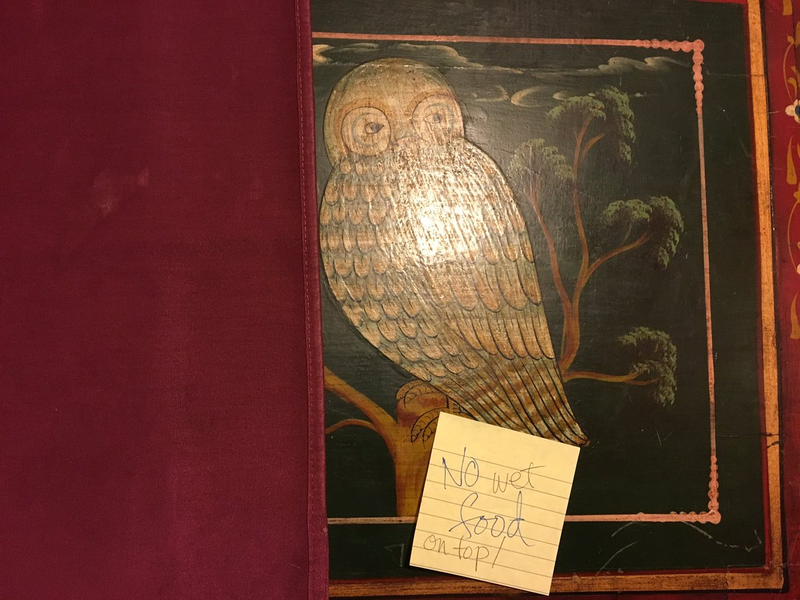 Using humor and art to smoothly communicate a somewhat uncomfortable message and house rule. There are also 50 ways to turn on a shower. It’s not as simple as I thought. 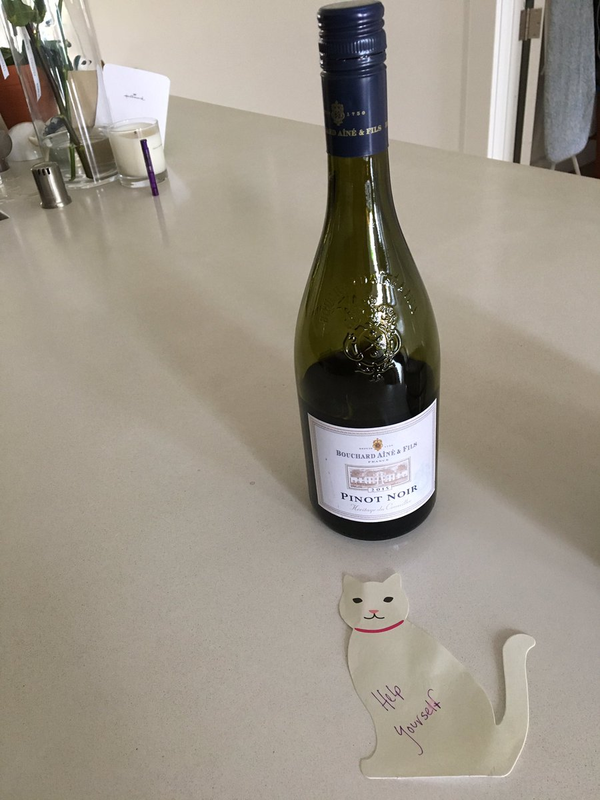 Label lightly can help the guests settle in. A good host communicates why a house rule is in place. 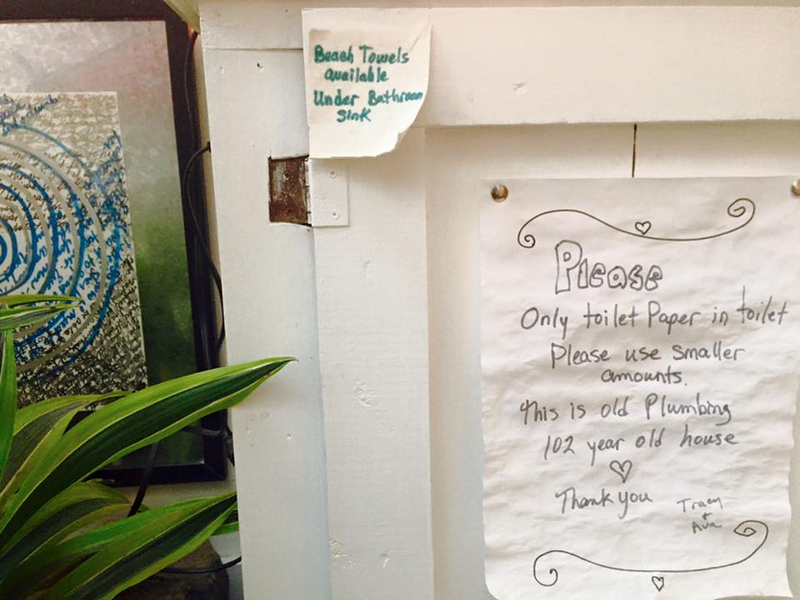 For example, this plumbing is 102 years old. 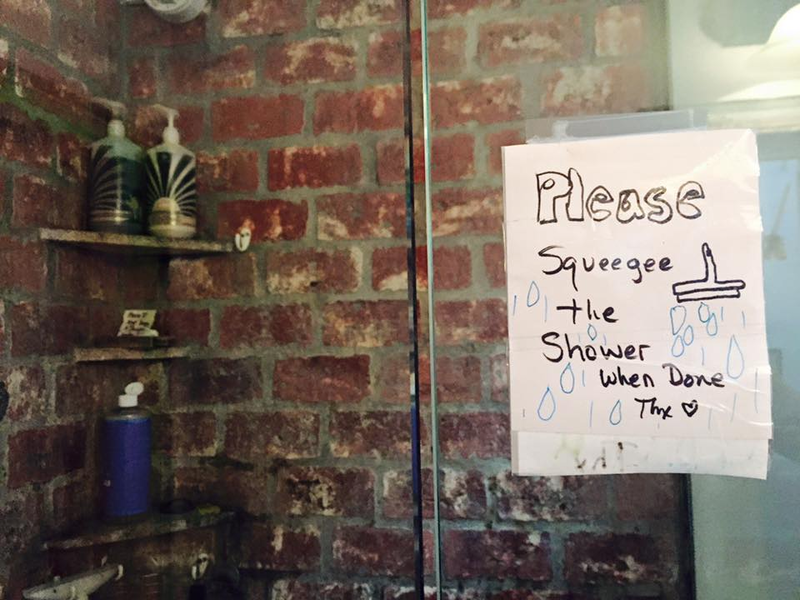 Squeegee can be a foreign concept for guests. 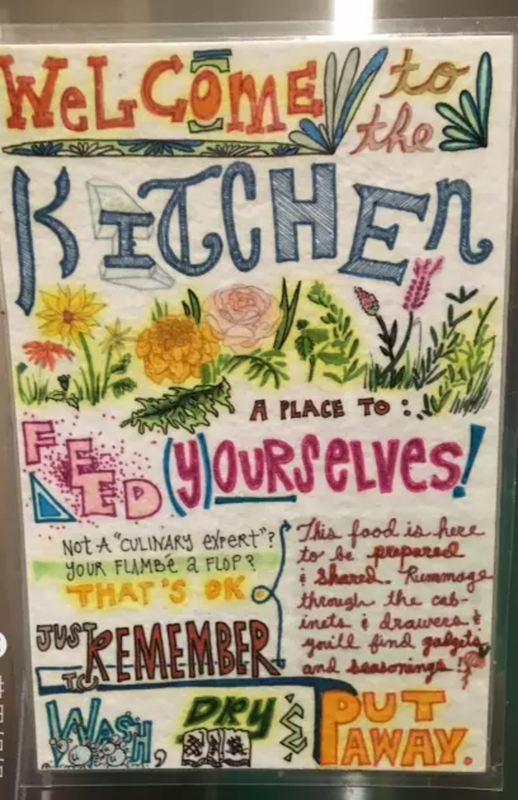 Draw it out and demonstrate how to use it. 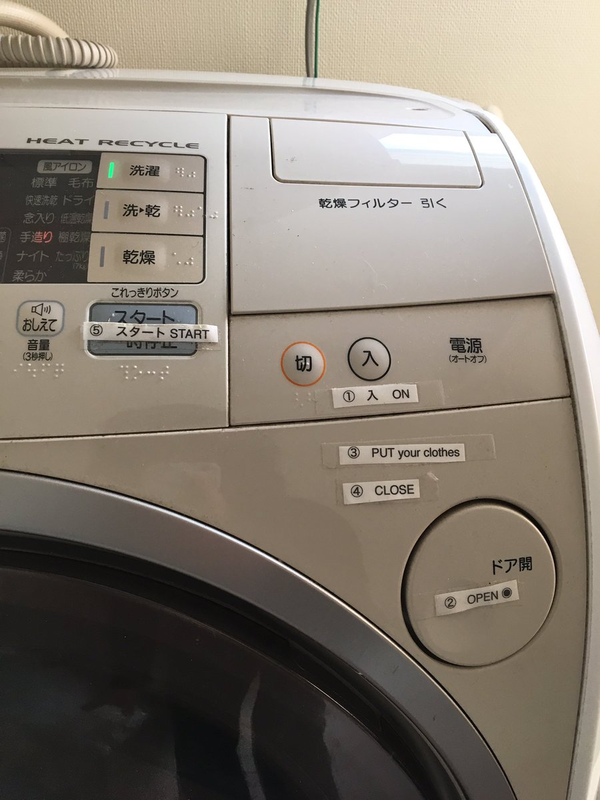 When traveling abroad, many home appliances have buttons in foreign languages. English Labeling makes a huge difference. Setting up boundary of using home appliances can be uncomfortable to deliver in person. Written notes on the machine deliver the message. 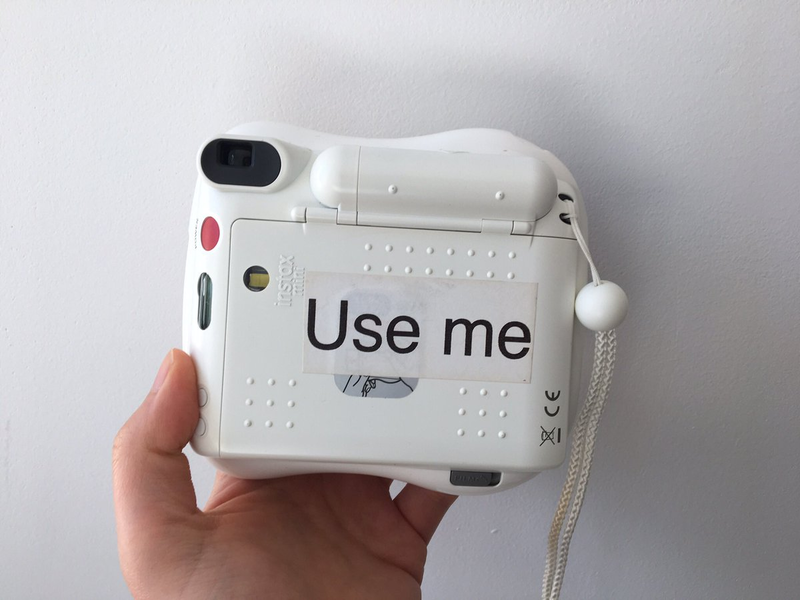 This label gives guests permission to use the polaroid. 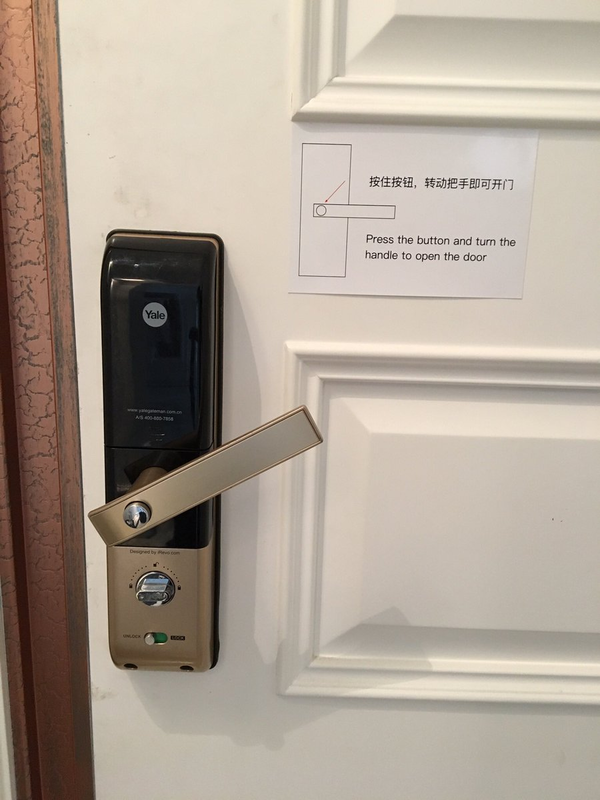 It also indicates that guests were not using it frequently before. 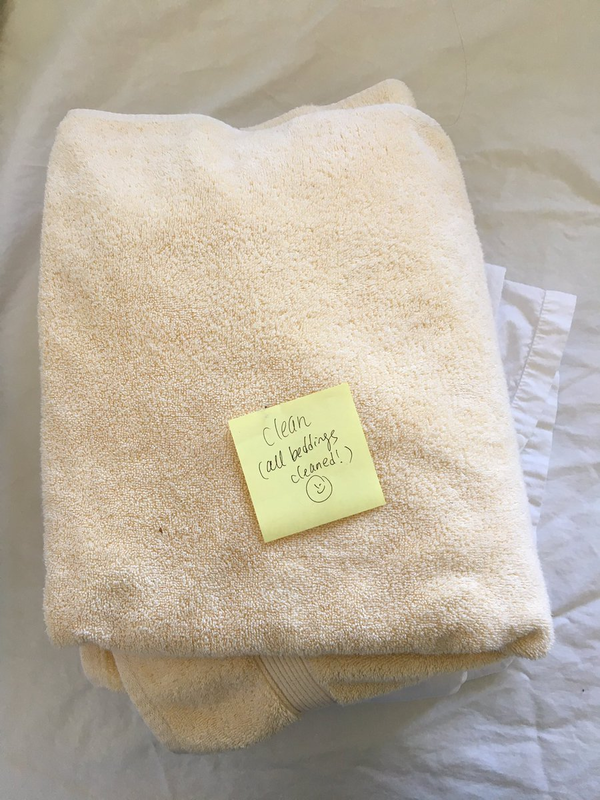 When you enjoy a great airbnb stay, it is natural to want to give back, even the small things. Returning key when checking out can be tricky if it was not thought through by the host. In this case, multiple guests lived in one house but in different rooms. 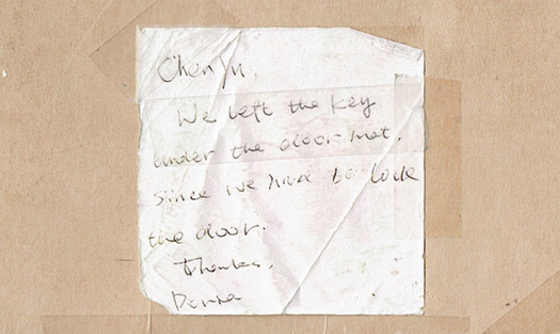 One guest checked out and left the other guest a note about where the key was located to return the key to the host. In the age of constant mobile messaging, technology still cannot replace pen and paper in key elements of a hospitality experience. 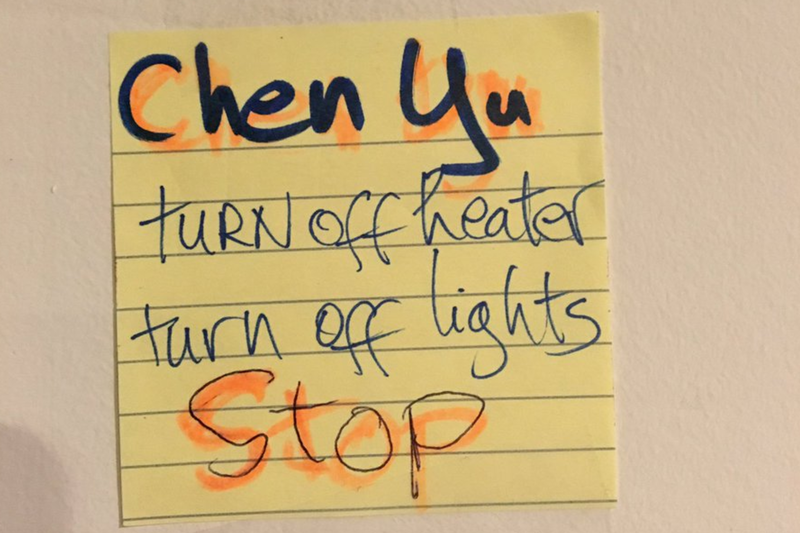 Written notes add a human touch to a hard fact or a reminder to turn off lights. 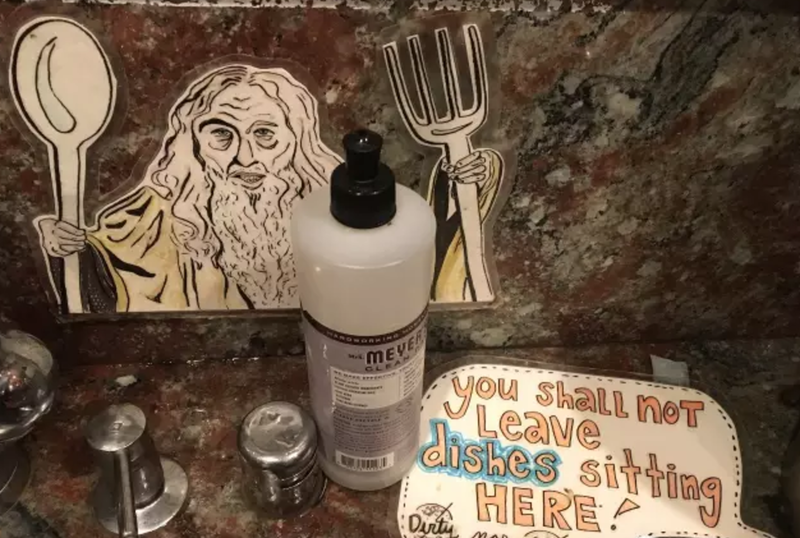 Hosts can connect humanity by how they choose to communicate the none-standardized house rules. 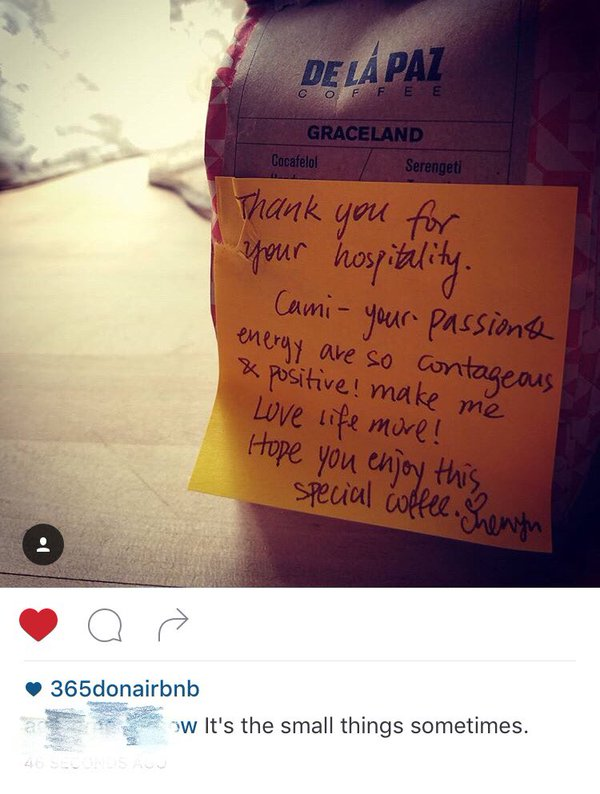 That’s the beauty of Airbnb community. Airbnb co-founder Joe Gebbia said that “Every time you see a duct tape in the world, that is a design opportunity. 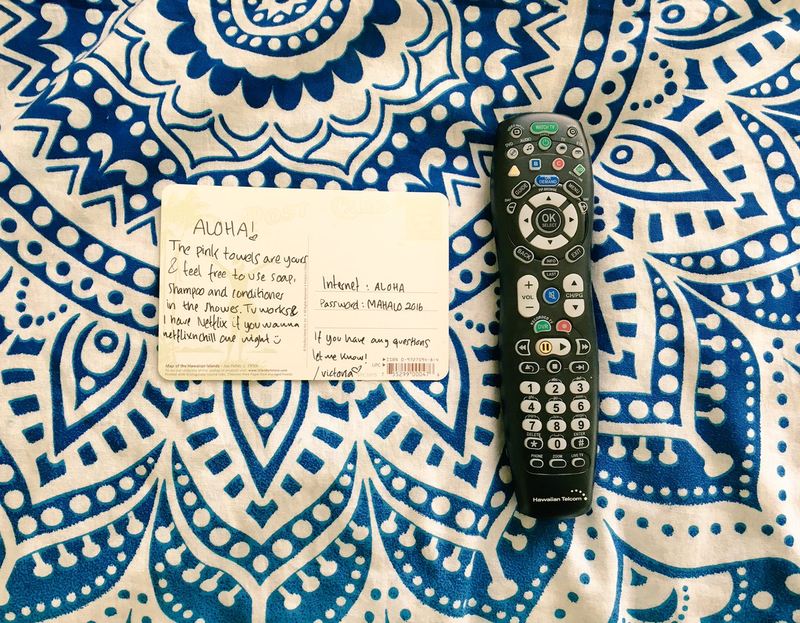 ” For an Airbnb experience, every non-verbal note (often a post-it note or label) is a bridge for communications or an opportunity to humanize a digital enabled connection. for the most tenacious to thrive and blossom. A dandelion grows in a crack. So does a kind heart.